First Line: "My voice faded into silence, though the memory of it seemed to haunt the theater as I slumped gracefully, trusting that Julian would catch me, however much he might not want to." Review: I loved Stolen Songbird so, of course, I was very excited to dive back into the world. 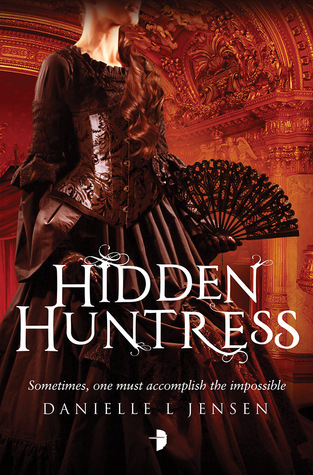 Now to be honest I didn't love Hidden Huntress to the extent that I loved Stolen Songbird but it was still a great read. I think what caused my love for it to dwindle slightly was the fact that there wasn't as much time spent in Trollus as I was hoping for. I really loved the hidden world of the trolls and sadly we didn't get to get lost in it completely because Cecile spent the majority of the book in the land of us humans. For all of you who have heard me gushing over Stolen Songbird on other social media platforms you know how much I love Tristan so obviously, I found his chapters much more entertaining and interesting than Cecile's, although once again I'm sure that has a little bit to do with the fact that Tristan was in Trollus and I was more interested in what was going on over there than with Cecile. Don't get me wrong I still love Cecile very much but one thing I realized is that I love Cecile more when her and Tristan are together on their adventures since let's be honest Tristan outshines Cecile and without him I found her chapters to read a little slower than usual and well for majority of the book they were apart and I was not happy at all, I missed the romance, the first book had the perfect balance and Hidden Huntress let me down when it came to that and I missed the chemistry between the two. Besides the issues I stated above I'm still a huge fan of this series. Honestly, the issues I stated above was me more so nitpicking than anything because overall this was an incredible read. Jensen knows how to write swoon-worthy characters with great character development. I love Cecile and Tristan they are definitely one of my favorite book couples out there and with the way Hidden Huntress ended I am dying to get my hands on Warrior Witch.